There is no perfect basic education system in the world. Each one has weaknesses and strengths. Transplanting an education system from one country to another is also not straightforward, as there are things outside the curriculum, learning materials, and pedagogical methods that can also shape basic education. Our culture, what we value, and how we basically treat each other can affect profoundly our schools. Worse, if we are not thoughtful enough, we just might copy from other countries what is wrong. To strive for what seems to be unattainable, it is important that we choose one value as a cornerstone. For basic education, I believe this value is equity. It is not enough to set high standards, what is more important is to provide every child an opportunity to reach such high standards. This does not happen by solely wishing. This can only happen with an unwavering commitment to funding schools adequately, promoting the well-being of every child, and recognizing that basic education is a right. And this is just the starting point. Having the best intentions is likewise not enough. Even before a child formally enters school, there are already existing differences and sadly, schools often only magnify such differences. How this occurs is often traced on how abilities are assessed, and consequently, how a curriculum is designed based on these assessments. Marc Tucker recently wrote an opinion article in Education Week. The article, "Student Tracking vs. Academic Pathways: Different...or the Same? 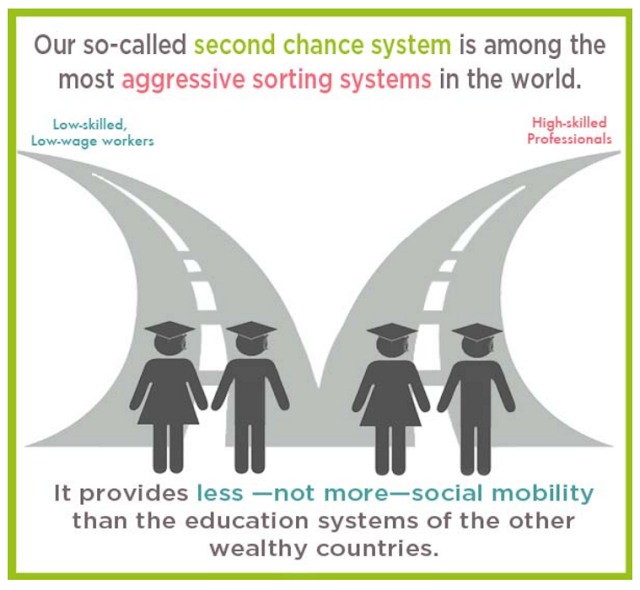 ", looks at how basic education in the United States fails to provide social mobility. Above copied from Marc Tucker's "Student Tracking vs. Academic Pathways: Different...or the Same?" "Here you see that unlike the Europeans, we sort kids into Bluebirds, Robins and other avian tribes when they first enter school. Before fourth grade is over, a large fraction thought to have low learning potential are almost certain to have the judgment verified, not because they could not learn, but because they were never given a curriculum challenging enough to learn anything. By the time they are in high school, if they have not yet dropped out—and many of these kids do, because they cannot read—they have been sorted into bins labeled selective college, college, vocational-technical and general. None of these kids, of course, have been formally labeled in this way, but they might as well have been. Because they know the kids on the underside of the sorting machine will get another chance, they just keep passing them up the system, unchallenged and uneducated." To measure the child’s readiness for Grade 1, DepEd will use the School Readiness Assessment Examination (SReA). SReA is aligned with the standards and competencies for five-year-old children. It is an assessment prior to entry to Grade 1 of basic education The language of the SReA will be the mother tongue. Through SReA, Grade 1 teachers have an accurate and reliable view of the child’s concepts and skills when they begin school. This is helpful in planning appropriate lessons, activities, and instructional materials. In the later years of elementary schooling in DepEd's K to 12, the situation becomes only worse. Both spiral progression and learner-centered characteristics of K to 12 are only expected to exacerbate achievement gaps in the early years of basic education. To top all of these, the later years of grades 7 through 10 are adulterated with "Career Pathways". And in the senior years, 11 and 12, tracking is firmly established. DepEd's K to 12 is indeed a hybrid of education systems. Unfortunately, it is the worst of both worlds.